Vacation rental cabin / bungalow. Sleeps 7, 2 bedrooms, 1.5 bathrooms. Cats, Dogs allowed. Just as its name says this cabin is By The River. Relax as the New River flows by. Spend a quiet evening with family in the living room. You are sure to enjoy the gas log fireplace. There is even a sleeper sofa for additional sleeping space. The kids are sure to love the Fooseball table downstairs. Another view of the Foosball table located just outside the living room. With seating for six, there is room for the whole family. After a long day, sleep well in this king size bed. The spacious master offers plenty of room. Aother view of the cozy master bedroom. A view of the tastefully decorated hallway. The guest bedroom is beautifully decorated. Rock your cares away or enjoy a quiet meal on the spacious deck. 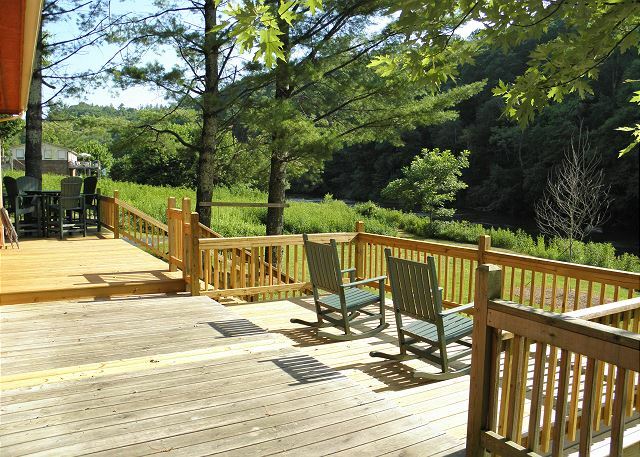 Enjoy river views from the front deck. The fire pit is just off the deck for easy access. Start the morning off right with breakfast on the deck. There is plenty of seating on this beautiful deck. The river is calling YOU! The private balcony off the master bedroom offers a quiet place for an early morning cup of coffee. Nestled among the trees but only steps from the New River. Relax in the hammock after a long day. The New River is in your own front yard. Curl up with a good book in the swing by the river. Enjoy Autumn "By The River"
There is plenty of space for the kids to play. Relax and enjoy the peacefulness of the river. Curl up with a good book in the hammock! Another view of "By The River"
Beautiful fall foliage along the New River. Jefferson, NC - By The River sits at the edge of the New River - just a hop-skip & jump from Zaloo's Canoes where you can rent canoes, kayaks or tubes and enjoy a day on the river. 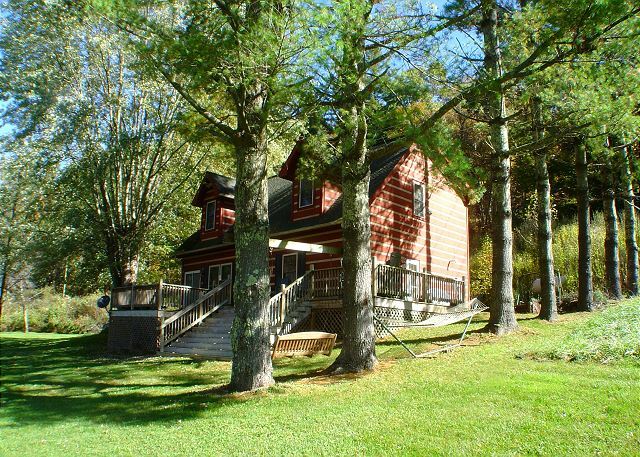 This spacious new log cabin is tastefully decorated and gives a right at home feeling. The main level living area features satellite TV and DVD along with a sleeper sofa for additional guest sleeping if needed. Double doors lead out to the open deck where you'll enjoy the gorgeous long range river views in both directions. Back inside, the well-planned kitchen and dining combo offer a built-in dishwasher, microwave and all the appliances and kitchen utensils you need to serve the family after a day of fun on the river. A wall-hung TV provides entertainment to the cook as she prepares the meal. A half-bath, laundry room, and game room with Foozeball table and DSL hookup are also on this level. Perhaps you'd rather have a cookout. There's a gas grill, picnic table, swings, and a patio table and chairs on the deck overlooking the river. Upstairs, the spacious master bedroom with plush king-sized 4-poster bed also offers satellite TV and a comfy leather recliner for enjoying some down time alone. Or, sip on your favorite beverage and read a good book on the shaded patio overlooking the river just outside the master bedroom door. A second bedroom features a soft, luxurious double bed, satellite TV and DVD. A large full bath with step-in shower and double sinks is conveniently located between the bedrooms. Towels and linens are provided, and you can bring the family pet along too. conveniently located on Hwy 16S near Jefferson, Glendale Springs and the Blue Ridge Parkway. So, pack your bags and head for the mountains to this great new cabin while it's still available! (MAX OCCUPANCY=6) Well behaved pets of all sizes are welcomed. 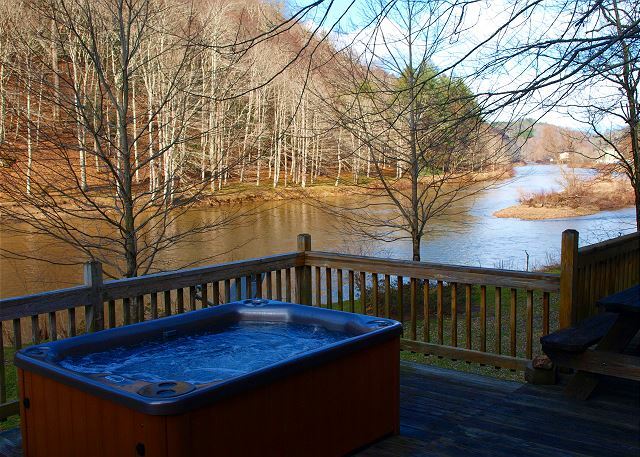 By The River is a Carolina Mountain Properties & Rentals property. Our calendar and rates are updated instantaneously. We strive to make it as easy as possible to stay at one of our properties. We will notify you proactively when an early check in is possible and you’ll receive the comforts of a luxury home when you arrive with a starter supply of paper products, hand soaps and lotions. In addition, we offer 24/7 emergency after hours service. Carolina Mountain Properties & Rentals uses one of the industry’s most trusted brand of software to securely store all guest data. All of our vacation rentals follow local and state tax rules. Each reservation includes applicable taxes, linen cleaning fee, and a processing fee. Carolina Mountain Properties & Rentals also offers an optional trip interruption insurance to protect your investment. Rooms Sleeps 7, Main level features large living room, kitchen and dining room, as well as a deb area with foosball game, and a half bath. Upstairs are two bedrooms that share a bath. King bed in master suite, and queen bed in guest bedroom. Sleeper sofa for guests. This is a perfect cabin for friends and family who wish to relax and have a nice time with each other. It is right by the road so the noise from the passing cars can be heard if you are near the fire pit or there is no noise in the house. The WiFi did not work so that was a con but only if someone really needs the phone. Luckily we had friends who had Verizon which works perfectly. The cabin was nice and clean with all necessity as mentioned in the contract. The river right besides is a great plus. Thank you for leaving a review of your recent stay at By The River. We will check on the WiFi and have it repaired. This home is close to Hwy 16 and you may hear road noise if you are in the yard. If you are in house, you do not hear the noise. Being on the banks of the New River makes up for the road noise. We look forward to having you stay with us again. We had a great fall trip, cabin was perfect - spacious, clean and had all the amenities. Far enough away to feel secluded, but close to town. We are thrilled to hear that you enjoyed your stay at By The River. We look forward to having you stay with us again. By The River was incredible and exactly what we needed as our first vacation in three years. The cabin was beautifully decorated and maintained. The view of the river was incredible. So peaceful and quiet. The proximity to downtown West Jefferson was convenient and the local restaurants fantastic. Check in/out was very easy and the property management company was so friendly. I've seen several guests noting the noise being on the main road, but we never noticed it. It's the perfect spot for a quiet getaway. We are delighted that "By The River" was perfect for your vacation. We look forward to having you stay with us again. a guest from Surf City, NC does not recommend this vacation rental. Restful. Great river view. Hard to get into and out of. Terrible traffic noise. Clean on inside but dirty on the outside. Thank you for taking the time to leave a review of your recent stay at By The River. The owners are working to have the driveway paved to make access easier. The road noise can be heard from the driveway but normally you cannot hear it inside the cabin or when you are inside. The trash that fell off the truck was picked by our cleaning staff as soon as we learned about it. We certainly hope you will stay with us again and if you need a quieter place please call our office and ask. We will be happy to help you find a quiet, relaxing property. This property was ideal for our family vacation. It is pet friendly, and our dog loved it as well. Beautiful overall. River was relaxing (a little cool). House was spacious and very clean. Would recommend this place. We loved it. Thank you for taking the time to leave a review of your recent stay at By The River. The home welcomes all size pets and offers a beautiful setting. We look forward to you staying with us again. We are delighted to hear you enjoyed your stay at By The River. This was a great rental. Only downside was the traffic but after the first night we got used to it. Beautifully decorated throughout. Kitchen had everything you would ever need, (even a set of wine glasses). Great place to tube and enjoy the river! One suggestion- needs some sharper knives in kitchen. We had trouble slicing tomatoes! Thank you for leaving a review of your stay at "By The River." This home is off of Hwy 16 but once you are in the front yard and close to the river, you never pay attention to the traffic. We will check on the knives. We look forward to having you stay with us again. We had a great time and the property is amazing. Thank you for leaving a review of your recent stay at By The River. It is a great place to relax and enjoy the New River. The owners have added two new rocking chairs to the deck area. We look forward to having you stay with us again. We enjoyed our stay at "By The River". The cabin is exactly like pictured on website. It was very Clean and Neat. Be advised you may need a All wheel drive or 4 wheel drive vehicle to get up the steep driveway. We have a 2017 GMC Acadia All wheel drive that went up the driveway with no problem in all wheel drive, but would not go up the driveway in front wheel drive. We definitely liked the layout of the cabin. The River View was beautiful. The kitchen is well stocked with essentials. It is just minutes away from Restaurants and Shopping in Jefferson and West Jefferson. We will be renting this cabin again. Thank you for leaving a review of your recent stay at By The River. The owners are looking to either pave the driveway or scrape it at least to smooth it out. We look forward to having you stay with us again. Our stay in Jefferson cabin was very nice. Thank you for leaving a review of your recent stay at By The River. Great we had a wonderful time caught and released many fish. Relaxed a lot on the deck enjoying the view and peacefulness of the New River while grilling and dining with friends and family. This is a return trip for my wife and I we were there in 2010 and loved it so. We are delighted to hear that you enjoyed your return visit to By The River. We look forward to having you return again in the near future. Enjoyed a week over the July 4th holiday. The only draw back is the noise from Hwy 16 S which the property resides on. So glad to hear that you enjoyed your stay at By The River. 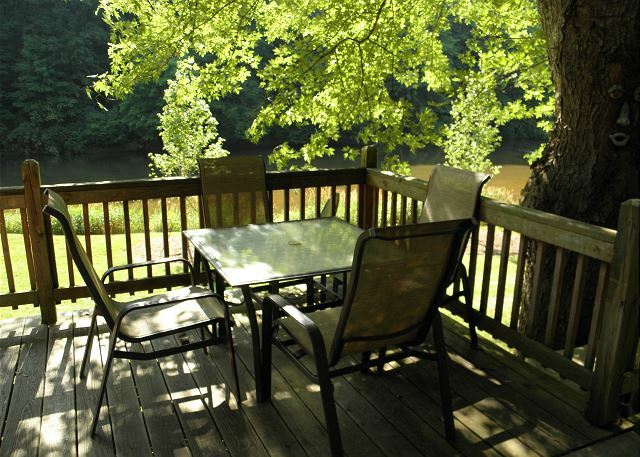 The river is in your very own backyard at this property. We hope to have you stay with us again. By the River - lovely! By the River is a very nice house. Well laid out and well appointed. We were delighted also with how cool it was in Ashe County (compared to Wake County). Carolina Mountain Properties was really very, very good to work with!!! Hope we can do it all again. So glad you enjoyed your stay at By The River. The mountains are usually at least 10 - 15 degrees cooler and with lower humidity. We hope to have you stay with us again. A place to relax ! Excellent visit! 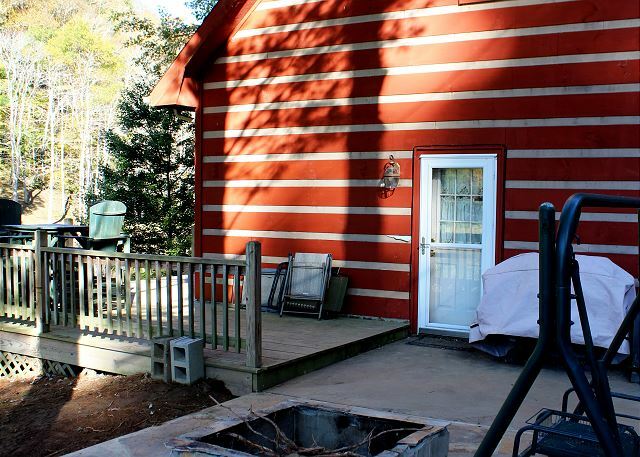 Everything you could ever need is right there at the cabin. The cabin was very clean and well kept. If i have to complain about something it would be the limited access to the river. Only one small space to actually fish from unless unget out into the water. Other than this, it was a perfect visit!! So great to hear you enjoyed your stay! We will be happy to check on the access to the river. In order to prevent erosion, some owners choose not to cut growth along the river bank too short. We hope you will come back and stay at By The River again soon. It was very hard to leave.. place is very clean and comfortable.. slept really well and would love to go back again for an entire week.. the river is right on the property so it can be a lot of fun in the summer..
We had a great weekend at By The River. The cabin is really cute and well furnished. We loved being right on the river. The only negative is that the cabin is located on a very busy road...like right off of the road. The noise from the cars going by is quite loud if you are in the bedroom. The bedrooms are on the street side of the house. All in all, we enjoyed the cabin and would consider staying there again. Fabulous vacation spot. Relaxing and quiet. Mom and I love to sit on the spacious porch and read while listening to the New River flow by. New living room recliners made our stay even nicer...thanks!! Carolina Mt Properties couldn't be better to work with. Excellent vacation choice. I hate so bad to have to share my experience Labor Day weekend at this cabin. The cabin was great! No problems at all with cabin. I have to tell you, someone came on the property during the night and seen the need to steal a couple of items off of my vehicle. That was just so unbelievable! Never had any problems where we have stayed in the past. I am sorry to say we won't be staying at this property anymore. We will continue to rent thru Carolina Mountain Properties. From my phone call to the Realtor, I don't think they have ever had to experience any problems like that. I hate so bad I had to share because we have always had great customer service and always was very pleased with the other cabins we have stayed at. True what previous vacationers said ...traffic was loud, however, the view and access to the river outweighs the traffic. Clean and comfortable. Wonderful stay, views and rafting experience! My husband and I have stayed here several times and we really love it! Nice place to stay with our dog, very comfortable and well equipped. Convenient location! The house was not clean upon our arrival. We cleaned it better than it was on our departure. The outside needs some maintenance with the gutters had grass and trees growing in them. They need to be cleaned or it will ruin the roof. There were dishes in the cabinet not washed. Who ever stayed before used the pans/pots and didn't wash them. Overall nice getaway cabin, but needs some TLC outside. Thank you for leaving a review. We certainly wish you had called when you arrived to let us know about the issues you had with the cleanliness. We would have immediately sent someone out to attend to these issues. We enjoyed our stay here. The setting is beautiful and the,house is great. The only thing we did not like was the proximity to a busy road, but we were able to overlook that due to all the positive things about this property. This has been one of our favorite cabins we have stayed in. Upon our arrival there was no heat and the house thermostat read 41 degrees until the gas tank was refilled at around 10:30 that evening. The water pipes were all frozen and remained that way until 11:00AM the following day. (We had no running water...couldn't flush toilets, etc.) The rental company did respond to our needs and addressed the heating and frozen pipes, however,we felt like the house simply was not prepped for renters. The property was just as pictured through the rental company.The house is simple, but had everything you would need for a comfortable stay. We stayed during the winter and during a snowstorm, but I can only imagine how PERFECT this rental would be in the summertime. 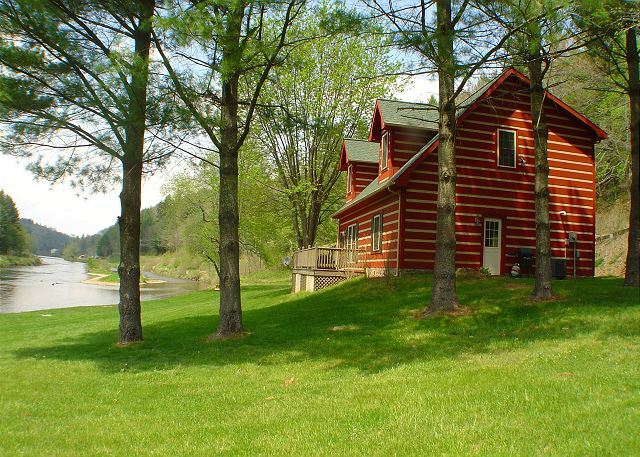 It is right on the river, with lots of yard space for outdoor activies, tubing in the river, etc. The only other problem we encountered was that WiFi did not work. Thank you for taking the time to leave a review. We certainly do apologize that your stay got off to a rocky start. The house had been checked prior to your arrival but due to the extreme cold weather and gas not being on an automatic refill the pipes did freeze. The cabin is a wonderful place during the summer and is in the winter as well. We will check on the WiFi and address that issue as well. We arrived to find out that the cabin was right on a busy road. We found that the traffic was able to be heard all night. The cabin was very clean, comfortable and in nice condition. I emagine if we had come during rafting season, it would have been better. There was no cell service, so it was difficult to call different towns to find out if they had any excursions available for the day. Overall we would stay there again. Probably better with 2 famlies. A little creepy not having a security system and right on the road. Thank you for taking the time to leave a review of your stay at By The River. Cell phone service depends a lot on your service provider. Verizon seems to work the best. The telephone in the cabin is for local use but you can call out long distance by purchasing a call card. is a great place to stay for a couple or a small family. During warm days, one can go tubing, canoeing, or swimming right there at the house alongside the beautiful property. We had every thing that we needed, the location was great. The beds and the river was great. I have and will continue to recomind you to everyone. There were a few hiccups. The grill was inoperable. When reserving the property i was told a credit card would be used to "hold" the property while they waited for my check, but then my CC was charged for my stay. This was credited promptly. While on vacation, I received a call to see if the property could be shown during my stay. Otherwise, the property was in a wonderful location and I absolutely loved it. Will stay again if the grill is fixed. We had a great time at By The River. This is not our first time renting this property and we absolutely love it. Just wish it had another shower! 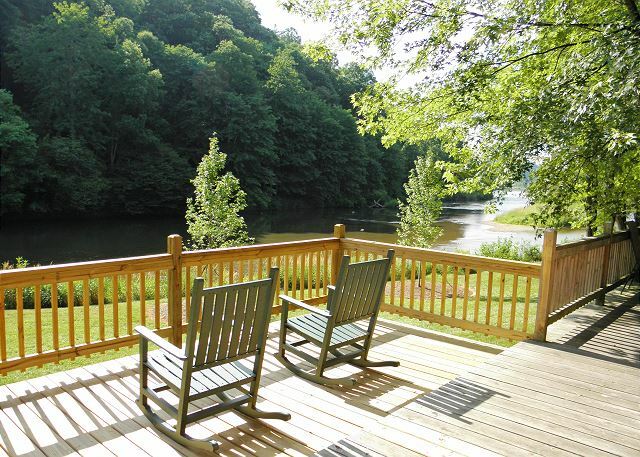 But it is perfectly situated on the banks of the New River with an awesome deck and beautiful view! It is a very comfortable home that is well-equipped.